Inside Secure Circuit Camouflage Technology, also known as SecureMedia Library (SML), is an anti-reverse engineering and anti-cloning protection for integrated circuits that has both Commercial and Government Applications. 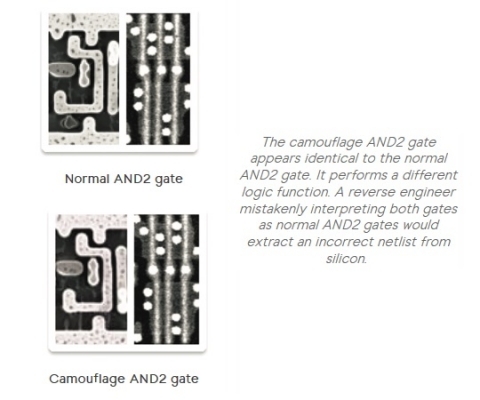 The Circuit Camouflage Technology significantly increases the level of difficulty while decreasing reliability of reverse engineering efforts of a circuit. SML utilizes foundry standard cells, standard tools and design methodology, doesn't rely on coatings or shields, and provides a high return on investment for silicon manufacturers, chip makers wanting Intellectual Property protection and having products in high attack environments. The SML is available in silicon technologies down to 28nm and Inside Secure is currently working on a project in FINFET 14nm. With the Circuit Camouflage Technology, chip makers keep sensitive and strategic aspects of custom designs secret from competitors and counterfeiters, providing hardware protection to secure intellectual properties. Additionally, Inside Secure s Camo SmartFill provides high tamper resistance from unauthorized modifications to the design by filling the entire chip with circuitry allowing attackers no space in which to insert a Trojan circuit without destroying the underlying function of the ASIC.